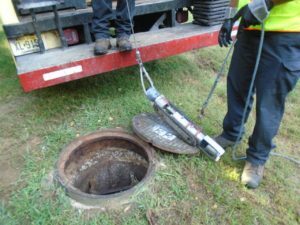 TMSC Sewer Segment Repairs Project – KC Engineering and Land Surveying, P.C. This project consisted of the excavation and removal of an 18-inch PVC sewer line in preparation for the installation of a new 171-foot long, 18-inch PVC sewer line. In addition to the installation of the new line, repairs in other segments of the sewer pipes included removal of root intrusions, sewer main cleaning, air testing, and television inspection. Additional services included the installation of a permanent gravel access road; the restoration of disturbed areas that were not covered by gravel road, mulch, and seed; and the addition of a manhole riser to lift a segment of the sewer.